The CR 210 / I-95 improvement project in northwest St. Johns County includes adding additional lanes along CR 210 and improving operations of the signalized intersections. The need for these improvements was evidenced by chronic traffic delays and backups along both CR 210 and I-95. CR 210 is being widened to accommodate dual left lanes and dual through lanes, and ultimately six-lane traffic from I-95 West approximately one mile to Leo Maguire Parkway. 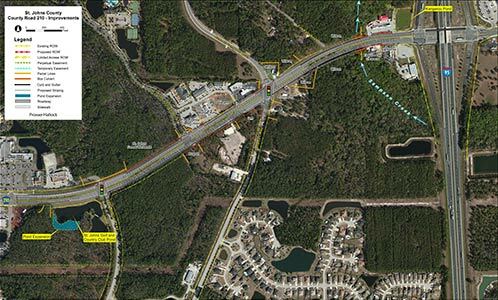 Being completed in cooperation with FDOT, this project has been ranked as a high priority by the St. Johns County Board of County Commissioners and will provide major safety improvements to the CR 210 / I-95 interchange. The CR 210 capacity improvements from I-95 to Leo Maguire Road commenced construction in April 2014 with a projected completion date of September 2015. Multiple St. Johns County transportation funds including FDOT funds will be utilized for this project. Facebook – like us on facebook at www.facebook.com/sjcproject210 to receive Project 210 updates in your newsfeed. Twitter – follow us on Twitter at www.twitter.com/sjcproject210 to receive Project 210 update tweets. Email Alerts – subscribe to the SJC Project 210 Email Alerts to receive updates directly in your email inbox. Text Alerts – text “follow @sjcproject210” to 40404 to receive text message updates directly on your mobile device. Go Mobile – Iphone and Android users can visit sjcfl.us/Project210 on their mobile browser and bookmark the Project 210 icon directly to their homescreen to have one-touch access to current Project 210 updates. After-Hours Hotline – call the after-hours hotline at 904.209.0170 from 5 p.m. to 8 a.m. Monday-Friday, weekends, and Holidays.